On the 30th (Fri), take in the architecture and atmosphere at Budir Church, explore the fascinating underground world of Cave Vatnshellir, then take in the architecture and atmosphere at Olafsvikurkirkja, and finally take your sightseeing to a higher altitude at Kirkjufell Mountain. For traveler tips, ratings, other places to visit, and tourist information, read Snaefellsbaer trip planner. Portland, USA to Snaefellsbaer is an approximately 13.5-hour flight. Traveling from Portland to Snaefellsbaer, you'll lose 8 hours due to the time zone difference. Finish your sightseeing early on the 30th (Fri) so you can drive to Vik. 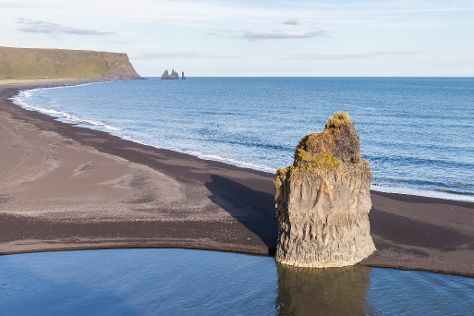 Start off your visit on the 31st (Sat): kick back and relax at Reynisfjara Beach, trek along Sólheimajökulll, then take in the dramatic natural features at Dyrholaey, and finally stop by Wool Gallery Vik i Myrdal. To see other places to visit, more things to do, where to stay, and other tourist information, go to the Vik road trip planner . Traveling by car from Snaefellsbaer to Vik takes 5 hours. Alternatively, you can take a bus. In August, daytime highs in Vik are 54°F, while nighttime lows are 49°F. Wrap up your sightseeing on the 31st (Sat) to allow time to drive to Reykjahlid. Start off your visit on the 1st (Sun): explore the activities along Lake Myvatn and then admire the sheer force of Dettifoss. 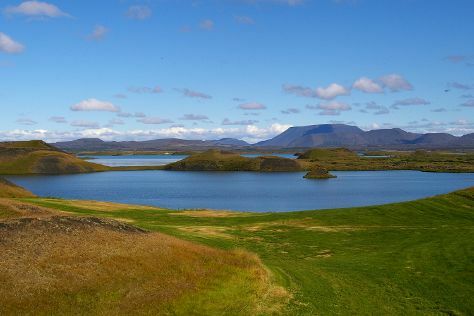 On the next day, look for all kinds of wild species at Krafla Lava Fields, witness a stunning natural landmark at Hverarond, and then take your sightseeing to a higher altitude at Mt. Namafjall (Namaskard). To find other places to visit, photos, maps, and other tourist information, go to the Reykjahlid trip planner . Traveling by car from Vik to Reykjahlid takes 8.5 hours. Alternatively, you can take a bus. Traveling from Vik in September, you can expect nighttime temperatures to be a bit cooler in Reykjahlid, with lows of 40°F. Cap off your sightseeing on the 2nd (Mon) early enough to go by car to Akureyri. Start off your visit on the 3rd (Tue): get up close to creatures of the deep with a dolphin and whale watching tour, admire the sheer force of Godafoss, and then steep yourself in history at Saurbaejarkirkja. To find where to stay, photos, ratings, and tourist information, you can read our Akureyri day trip planning tool . Traveling by car from Reykjahlid to Akureyri takes 1.5 hours. Alternatively, you can take a bus. In September, daytime highs in Akureyri are 52°F, while nighttime lows are 40°F. Wrap up your sightseeing on the 3rd (Tue) to allow time to travel to Reykjavik. Kick off your visit on the 4th (Wed): contemplate the long history of Videy Island, get to know the fascinating history of Reykjavik Open Air Museum, and then contemplate the waterfront views at Kerið. On the next day, see the world from above with a helicopter tour, enjoy breathtaking views from Perlan, and then cast your line with a fishing tour. To find more things to do, ratings, maps, and more tourist information, read Reykjavik trip builder website . You can fly from Akureyri to Reykjavik in 2.5 hours. Alternatively, you can do a combination of flight and bus; or drive. Expect a daytime high around 52°F in September, and nighttime lows around 43°F. Wrap up your sightseeing on the 5th (Thu) early enough to travel back home.